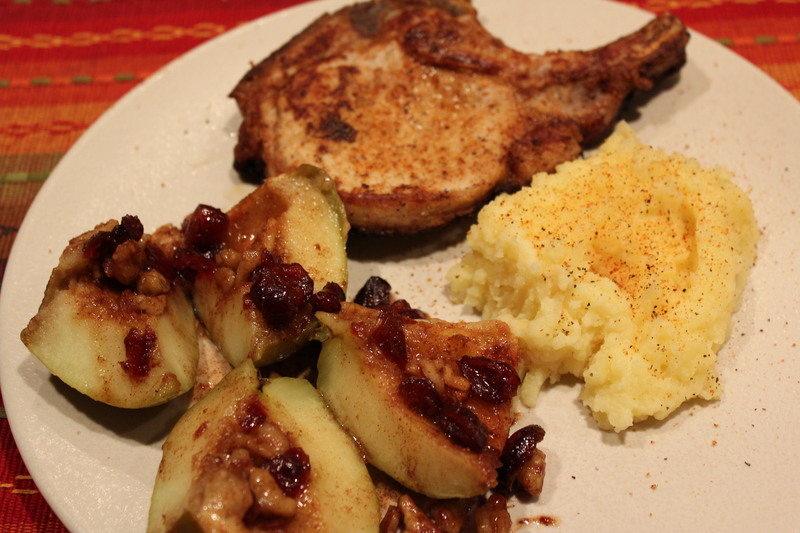 I wound up with an abundance of Granny Smith apples, so I decided to bake some of them to use as a side dish to some pork chops we were having for dinner. I remember my Dad baking Macintosh apples stuffed with raisins and brown sugar and what a treat they were. I did not have any raisins on hand but did have some dried cranberries, which worked quite well. I also added some chopped walnuts to the stuffing for their crunch. 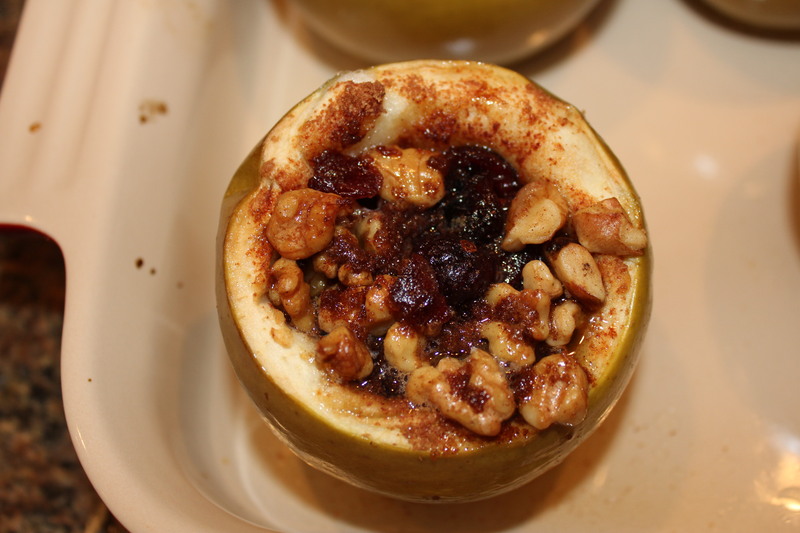 This is a great combination of flavors and I especially love the tartness of the Granny Smiths combined with the sweetness of the brown sugar and dried cranberries. I also love how my kitchen smells while these are baking – cinnamon and sugar – yum! 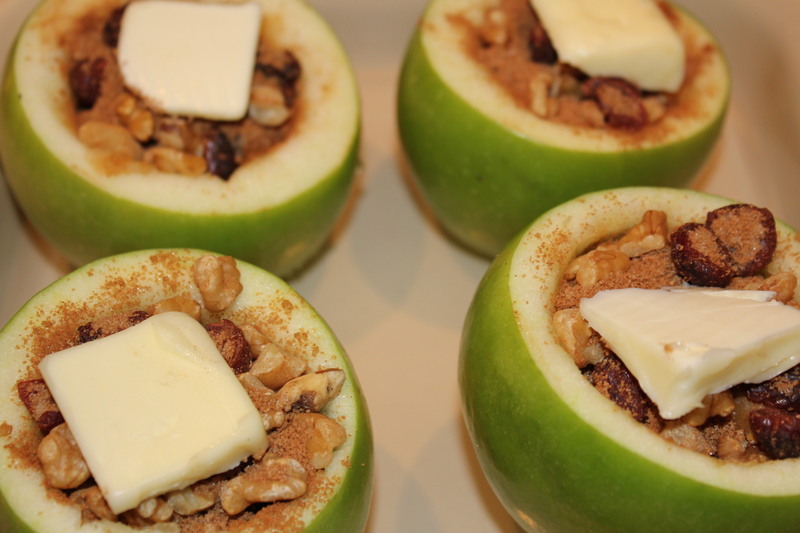 Slice the tops off the apples, about ¼ to ½ inch from the top. 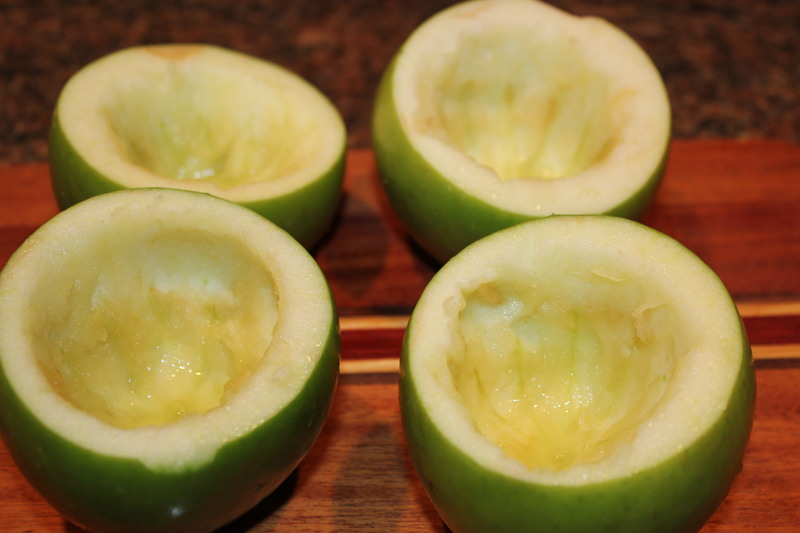 Remove the cores to within ¼ inch from the bottom of the apples. Scoop out the apple flesh using a spoon, leaving between ¼ and ½ inch from the sides. Sprinkle the apples with the lemon juice to help them from turning brown (you may have some lemon juice left over, which can be used later in this recipe. 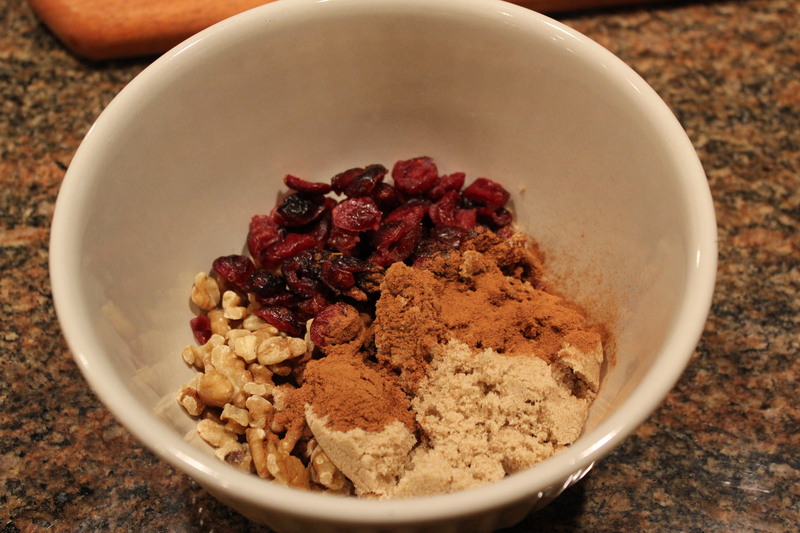 Mix the cranberries, walnuts, cinnamon and brown sugar in a bowl. 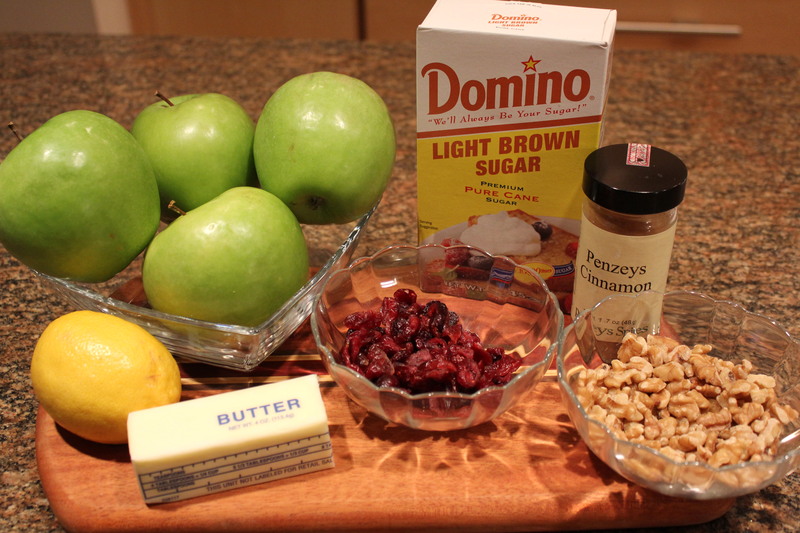 Stuff each apple with the cranberry mixture. You will probably have some of the brown sugar at the bottom of the bowl — no worries, just divide it evenly among the apples. Top each apple with a pat of butter. Place the apples in a shallow baking dish. Add the water and any leftover lemon juice. Bake for 40-45 minutes, basting the apples occasionally with the pan juices. I love to serve these with pork as mentioned earlier, or reheat them in the microwave the next day for breakfast. 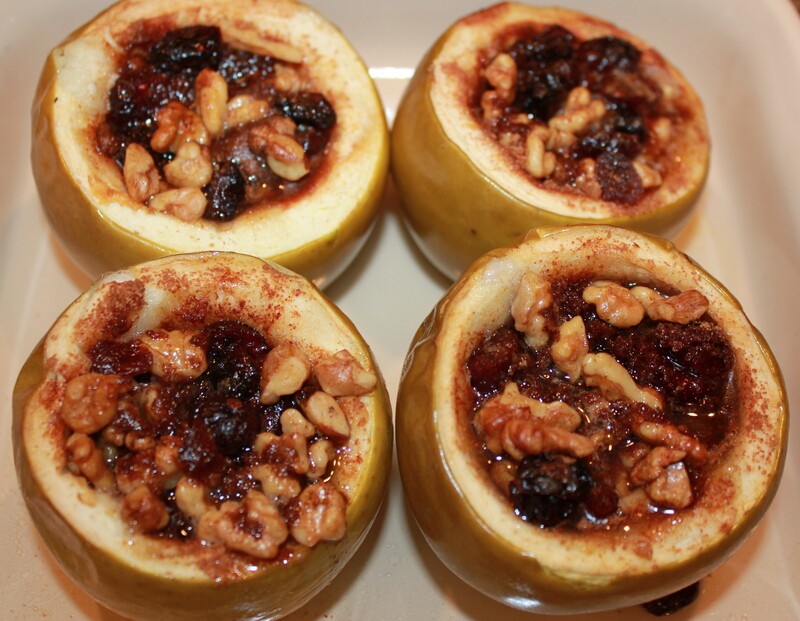 This entry was posted in Recipes, Vegetables/Vegetarian/Vegan and tagged Baked apples with cranberries and nuts recipe, Baked Granny Smith apples, eat drink and be merry, Granny Smith apples stuffed with cranberries and nuts, Kel's baked apples, Kelley Chisholm recipes, vegetarian recipes. Bookmark the permalink.